This steamed salmon dish is perfect for when you are setting the table for one. The whole dish can be cooked in less than 15 minutes, so it’s fast food with a healthy twist! Made using a Panasonic Steam Combi Microwave. Pour water into tank before steaming salmon and vegetables. Salmon: Place salmon into microwave steamer bowl with the skin up. Salmon: Select Steam 1 or medium heat seating for 9-10 minutes. Salmon: Set aside to steam vegetables. Vegetables: Arrange broccoli and snow peas into microwave steamer bowl. Vegetables: Select steam 1 for 3-5 minutes. 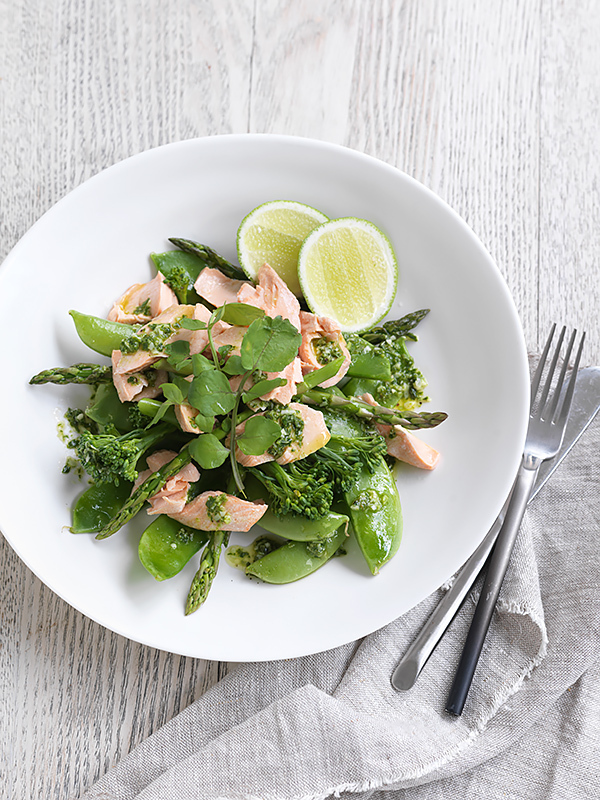 To Serve: Mix watercress and steamed vegetables in a bowl. To Serve: Fork salmon apart and arrange on top of greens. To Serve: Garnish with extra watercress and serve with lemon wedge.